This frosted, blown glass shade is tinted a beautiful amber at the bottom, which gradually fades to a lighter amber towards the middle. 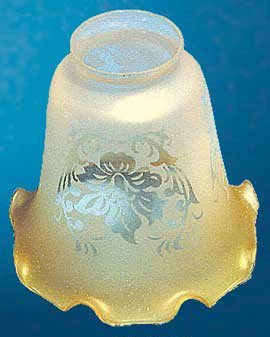 A clear floral motif has been reverse-stenciled in the frosted finish. Suitable for early electric fixtures. 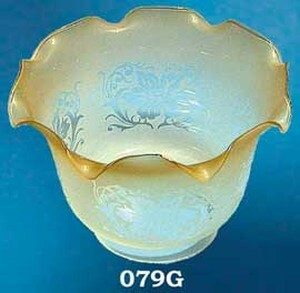 This shade was popular from the beginning of electricity, around 1895, through the mid 1920's. The tipping of color is hand-applied, so there are some slight variations in color. Order the full number of shades that you need all at once, so we can find the best matches within our inventory. Decorator's Tip: Order one extra shade for insurance against future breakage. 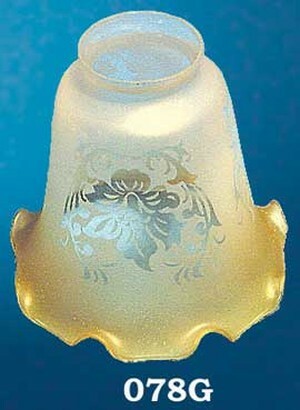 Even before common household use of electricity, this style of shade was a popular choice for gaslight fixtures. For those of you with transitional lighting (lights with both "up" and "down" shades), our 4" fitter gas shade 079G matches this electric shade. Light shades require special shipping. Save by combining products into one order.